"Okay fine, I agree, it is not yet proven false that Einstein would have had a catch with me whenever I wanted." Karl Popper was interested in the demarcation between science and non-science. That is to say, he sought to find an exact definition which would distinguish all things that count as "science" from those that don't. He found that earlier attempts to define science as something like "constructing theories that are verified empirically through observation" to be too broad. For example many horoscopes, which are clearly not science, are written in such a broad way that they can, and are, easily verified to be "true". My horoscope might say "you will find a good fortune today". If I were to attempt to verify this, and I went outside and found some money on the ground, it would indeed seem verified. But the same would be true if I heard some good news about a friend, or the weather was nice, or really any other numbers of things. The problem with the horoscope wasn't that it wasn't verified empirically, it was that the prediction was too general. For Popper, it could only be science if it attempted not to be verified, but to be falsified. So the horoscope would have to say "you will find some money on the ground today, and if you don't the theory of horoscopes is false." This is a much riskier prediction, and only theories that make such exact, specific predictions, which would cause the theory to be thrown out if they were not found to be accurate, can be true science. This caused him to rethink many theories of the day that he has admired, which were trying to claim to be scientific. 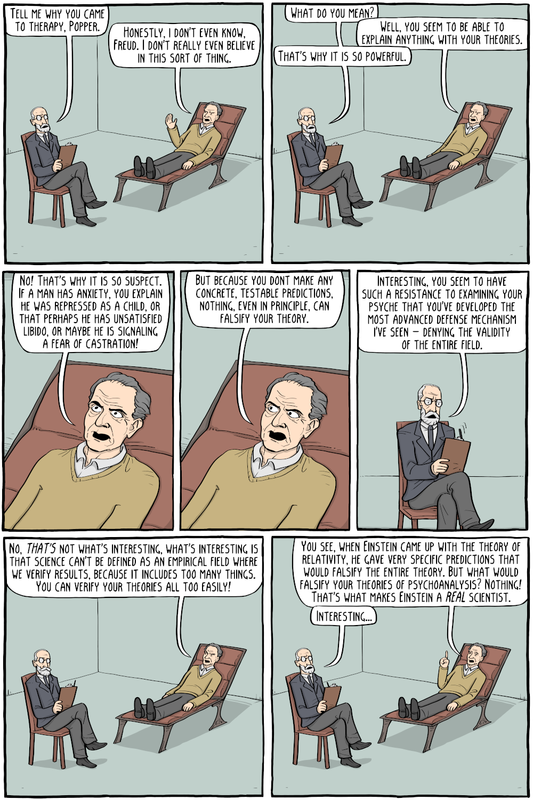 Freudian psychoanalysis was one such prominent theory which he found to be lacking. It seemed as though Freud's theories could explain anything and everything, but they never seemed to make specific predictions which put the theory as a whole in danger. The human psyche was so complex that there were always alternate explanations for everything. For example, say Freud found that an overly strict father caused anxiety and repression later in life. Popper points out that in order to be a real science Freud would have to stake the reputation of the theory itself on predictions in specific cases, such as that a man who was anxious and repressed had an overly strict father. 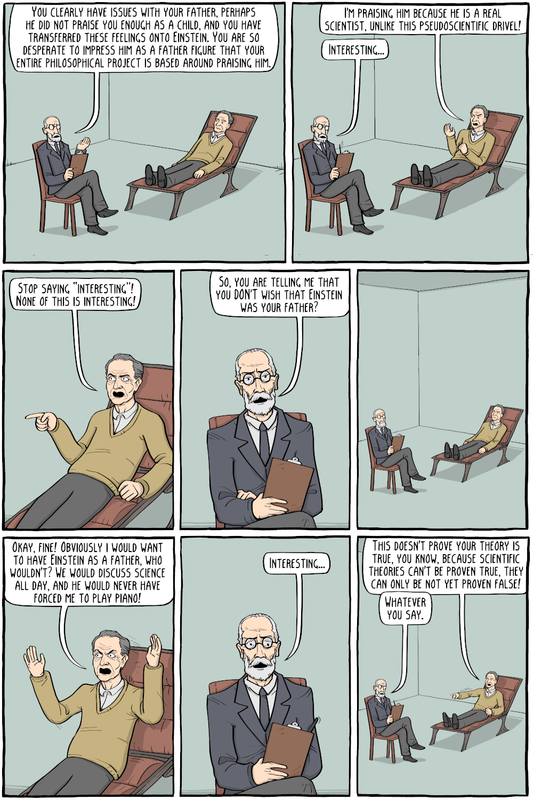 But if the Freudians found that a man's father wasn't that way, they would simply find another Freudian explanation for his anxiety, rather than discard the theory. Of course, there is more than one cause for anxiety, so this might be a sensible course of action, but at least for Popper, not scientific. Popper does not make the stronger claim that what Freud was saying was not true, or that it was completely useless, just that it was a different sort of inquiry than what Einstein was doing, who had made extremely exact, falsifying predictions about how light would bend around a black hole, etc.